You're hearing your sound cycling through the main outs while you've plugged a cable to one of your individual voice outs.Is there's something wrong?Nop, you are a victim of T's voice architecture...ATTENTION!!! Read below!!! Tempest's individual voice outs are hardwired to their respective synth voices. This means that when you plug a cable into one of these jacks, you are effectively removing that voice from the signal path altogether: i.e. from the main-outs, from the master FX, etc. So when you have a cable plugged into one of the voice-outs, as the Tempest randomly cycles through voices, whatever sound gets picked up by that voice will then appear at that output momentarily. To avoid this behavior you can assign sounds to specific voices. You do that via the 'Choke and Voice Assign' page, the shortcut to which is holding 'Shift' and pushing the 'Mod Paths' button.Finally the number of assigned sounds depends on how many cables you are plugging to the individual voice outs.And now that we've mentioned cables let's see what type do we need for the Tempest. • Hold down "mod paths" when changing beats to retain beat FX settings. • Shift+Mod Paths takes you to voice assign (16 Sounds/Sounds mode). 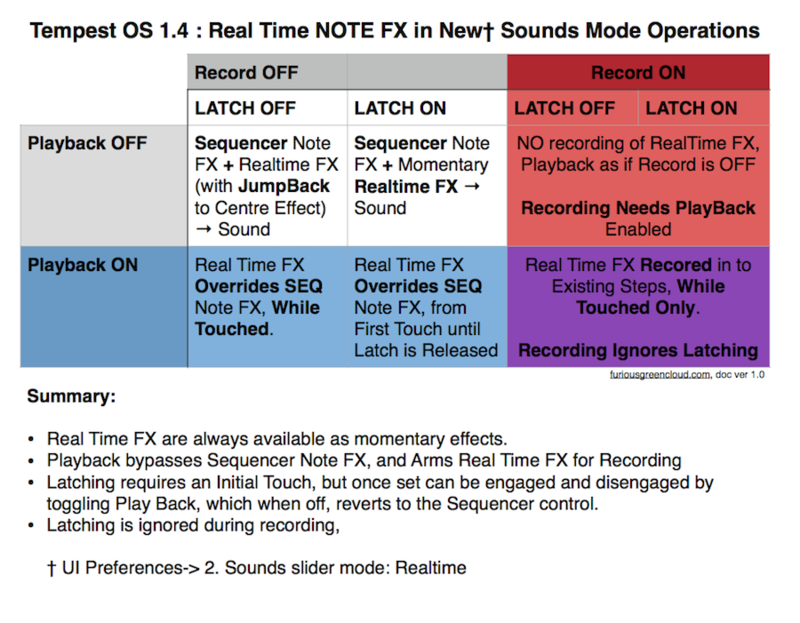 • Shift+Real Time FX playback for intensity or destination of the note FX values. • Holding both shift buttons + Stop is the MIDI panic button. • Holding both shift buttons + System button takes you to Tempest’s system root menu.There you can do lots of cool stuff to your Tempest like formatting it,saving your custom init setups etc. • You can control the level of a single analog oscillator by turning the second oscillator to 'off'. When only 1 oscillator is used, the OSC 1/2 mix param acts as a level control. • In 16 sounds, you can press shift and a pad to select that sound with out sound being triggered. good for going into 16 tuning mode live. • Don't use the Save/Load button for loading individual sounds for pads. When in 16 Sounds/ Pads mode, the upper two soft knobs let you load sounds for the pad you are playing easily. just keep hitting the pad as you turn the upper right soft knobs to hear each sound. 4) Now roll beat by pressing that beat pad instead of roll button. • Press and hold the 16 sounds button, select a pad.This way the pad doesn't triggers.It's like the Hold Shift+ Pad fuction. • If you half the tempo of your beat/project before you start recording anything you can achieve double the bars per beat. • The mixer page can reveal the delay settings and the distortion/compression page with the Page up/ Page down buttons. • While recording, hold a slider position and punch in and out with the playback button. • If you keep the slider assigned to beat-roll held down on BEATS or MUTES screen and then, while still holding the slider, switch to the SOUNDS screen, take your finger off the slider and presto! The roll is latched! This might seem useless being the ROLL button latches, but you can cut a beat roll down even further with the sliders and create a nice 2/4 signature and latch it. Perfect for those tricky transitions.I've also found you can use a similar function in the TIME STEPS screen by holding down the SHIFT button. An option for "Loop Screen" will appear. set this to the midi channel that your external instrument is receiving on. 3. Scroll to #6 MIDI:Sequencer Sound, choose a pad you want to use to sequence your external instrument. 5. On the pad you chose to sequence your external instrument, set the amp envelope amount to 0, and the amp velocity to zero. If you do not set these to zero you will get a distorted clicking when external instrument is receiving notes. Now you should be able to play your external gear in 16 tunings mode for that pad. You can also record what you play into Tempest's sequencer, OR sequence in 16 steps mode. For now the Tempest only sends pitch, velocity, and duration. • Hold step in 16 time steps and press FF or Rewind to move that step forward/backwards by one quantize amount. • Samples on OSC's 3-4 now organized into Categories and can be skipped by hitting Shift+softknob. • You can start Tempest at any bar.Just hit the FF/RW buttons to take you to the desired bar then while holding the Stop button hit Play. 2) Mess around with various combinations on Delay parameters for Pitch,Filter,VCA or Aux envelopes.A setting of 1 will do the trick.Also play around with VCA attack time & Peak. 4) Using the self oscillating filter is unstable as Chris stated unless sound assigned to a voice.Try to use the waveforms of OSCs 1-4 instead if you don't assign a sound to a voice. 6) Take it easy on the Feedback!Settings beyond 80 create unstable environment. 7) Every tiny change you make in Tempest's envelopes counts so it's a mater of sweet spot in them.A spectrum analyzer can indicate these changes. 8)Hi-passing is a good way to avoid rumble when you crank up that feedback.Also it's a matter of sweet spot on this.A good range for kick/bassy sounds is between 1-4. 9)Try to design your sounds with volume and velocity at fixed max values and after you have a consistent result tweek the velocity you want to taste in case you need it. You can save your own Initialize templates by accessing Tempest system root menu and saving it there. Holding both shift buttons + System button takes you to Tempest’s system root menu. • Use panning as a dirty method to get recordable effect sends. Run one side of a voice out dry to a mixer, run the other side through an effect. Have it hard panned normally, and set up a note FX routing for panning. * Real Time FX are always available as momentary effects. * Latching requires an Initial Touch, but once set can be engaged and disengaged by toggling Play Back, * which when off, reverts to the Sequencer control. • Simple but very useful, but did you know you can achieve a quantised beat-wide revert by hitting the current beat's pad again? The beat will not revert until it reaches the position that corresponds with its quantise setting. Obviously this requires that the beat does indeed have a quantise setting in the first place. Wait - I this sends pitch? I thought I tried this and was unable to get more than a single note number, am I mistaken? BTW - thanks for this post, most helpful! Yep Tempest can send pitch also.. Thanks for that info - was able to get pitch info recorded into a pad and sent to via midi to an external synth. Very cool. I was unable to get the arpeggiator to work by pressing the roll button though. Is that working for others? so, can i use the tempest to play external samples in an external sampler? say, map channel 4 to a tempest pad and that pad plays a sample in the external sampler thats listening to midi channel 4? if so, can one use , say,, 8 tempest pads with unique midi note channels to externally trigger/control 8 unique samples in an external sampler? It's a shame that Tempest can output only 1 sequencer channel..Many users on the old forum have been asking for this. thank you for your input. cheers! Are you sure this works, because I'm trying to put an 8th note from the beginning of a beat to the end using this method. I also tried taking the second 8th note and putting it back to the one, but no go. This would be a tremendous help because as you may know the copy and paste functions only work for full bars! Could you go in depth on this one please? Ye it works..In 16 times step if you hold a lit pad and press FF it'll move that pad to the next one.If you hold the lit pad again and press RW it'll take it back to were it was.This has nothing to do with copy functions. 4) Using the self oscillating filter is unstable as Chris stated.Try to use the waveforms of OSCs 1-4 instead. 5) Assigning a sound to a voice can help also. I have looked at this rather extensively; this is the big reason I was so adamant about putting the wave reset feature in the Tempest, because the transients varied too much. The problem is this only works for oscillator playback and not for sounds that use the self-resonance of the filter or the feedback. The problem is due to the transition between states, pushing into self-resonance or heavy feedback is not a stable operation in a very similar fashion to a free running oscillator (see: chaos theory). This is similar to the effect you would get on many distortion units, where it is impossible to get an identical response each time you play through the unit. So you basically have two ways of going about it to stabilize the transient right now. One, using the oscillator for the transient and bringing in the desired amount of feedback/self-resonance after the transients using an envelope. Or, two, putting a second sound layered on top of the kick as the 'click'. There is also something in the pipeline that we've tested but haven't enabled in the OS. I'll talk about this more in the early betas after the 1.3 OS is out.
" While recording, hold a slider position and punch in and out with the playback button." => Don't understand that . But I made a suggestion for the developpers : would be AWESOME to keep this starting while keeping holding the STOP button. Very very useful when editing the sequence or even create live effects . Hold down the Oscillator 'Select' button to edit all 4 oscillators at once. The Pitch encoder changes the pitch for all 4 oscillators and the OLED displays the values for each oscillator individually so you can edit them all together or one by one using the soft knobs. If you half the tempo of your beat/project before you start recording anything you can achieve double the bars per beat. Great tips! After 4 years of wanting a Tempest, I finally bought one this week! So far, I love it. I'm a long-time MPC and Evolver user, so I knew I wouldn't be let down with this collaborative effort. Cheers to everyone who has contributed here. I'm reading everything and finding it all very useful. Use panning as a dirty method to get recordable effect sends. Run one side of a voice out dry to a mixer, run the other side through an effect. Have it hard panned normally, and set up a note FX routing for panning. Nice one bobbyquine added to the list!